From the main panel to the subpanel, you'd want to run either #6 copper UF cable.... Or if in conduit THWN-2 wire, either #6 copper or #4 aluminum. Aluminum is fine for a feeder like this. From the subpanel to the hot tub, any conduit will do, because all cabling must be wet location rated, and conduit is presumed to be 100% full of water anyway. My first choice, if you can bear the pipefitting required, would be Rigid or Intermediate Metal Conduit, which only requires a 6" burial depth and lets you use conduit for ground, saving a wire. I would not use EMT because it would rust quickly. I would not use Schedule 40 PVC, but would use Schedule 80 PVC. Inside the conduit I would only use THWN-2 and only copper, since it is outdoors and genuinely at risk for water exposure. You don't need to worry excessively about shock hazard past the GFCI hot tub panel, stopping shocks is its job. However California has seen at least one monstrous wildfire started from arcing in a bad hot tub connection, so AFCI protection is warranted if you are in a wildfire area. Not the answer you're looking for? Browse other questions tagged wiring pool diy-vs-pro hot-tub or ask your own question. How do I properly wire this outdoor junction box? 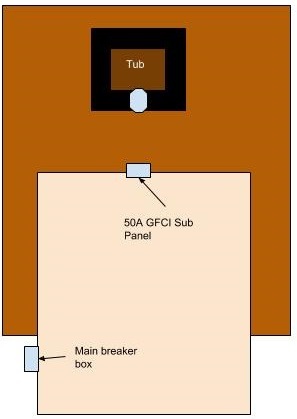 60 amp detached shop able to run 50 amp hot tub?